Introduction • Browse 102 Market Data Tables and 35 Figures spread through 150 Pages and in-depth TOC on "Polymer Stabilizer Market by Type (Antioxidant, Light Stabilzier, Heat Stabilizer), End-use Industry (Packaging, Automotive, Building & Construction, Consumer Goods), and Region - Global Forecast to 2022“. 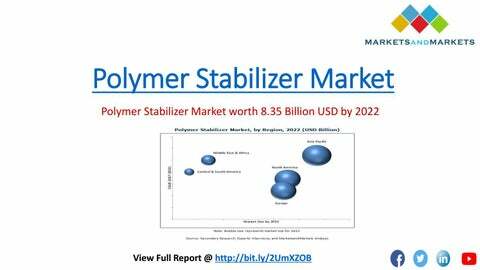 • The global market for polymer stabilizer is estimated at USD 6.88 Billion in 2017 and is projected to grow at a CAGR of 4.0% to reach USD 8.35 Billion by 2022. Drivers & Restrains • The increasing demand from the building & construction, automotive, and packaging industries is projected to boost the demand for polymer stabilizers. • The major factor restraining the growth of the polymer stabilizer market is the high manufacturing cost of the light stabilizer. • The light stabilizers market is capital intensive and the cost in terms of labor, and materials is high. • The materials used to manufacture light stabilizers are highly volatile and specific to the applications and need to meet the quality & government standards while delivering optimum coating solutions that not only have long-term benefits but also provide viable short-term benefits. Industry Insights • The polymer stabilizer market is classified into antioxidants, light stabilizer, heat stabilizer, and others based on type. • The market is led by the heat stabilizer segment in terms of value, mainly because of its wide use in almost every end-use application to protect polymers from extreme heat conditions. • The packaging end-use industry is expected to grow at the highest CAGR in terms of value, during the forecast period due to increasing construction activities, increased demand for automobiles, and rising trade. • Growing populations, and high disposable incomes are expected to lead to high demand for convenience and ready-to-eat packaged products during the forecast period. • This is due to the rising demand for eco-friendly and UV and heat resistant coating components to protect the packaging material and the products stored in that packaged material from degradation. Regional Insights â?&#x2018;The growth of the polymer stabilizer market in the Asia-Pacific region is attributed to the rising population due to which, there is an increasing demand for additional residential construction. â?&#x2018;This growth pattern signifies an increase in construction activities, thereby leading to an increase in the consumption of polymer stabilizer for the construction industry. â?&#x2018;Also, rising disposable incomes and improved standards of living are leading to consumers opting for new vehicles for their comfort, thus, leading to a rise in vehicle sales and an increase in the consumption of heat and light stabilizers. Key Players ▪ Currently, the global polymer stabilizer market is led by various market players such as BASF SE (Germany), Songwon Industrial Co., Ltd. (South Korea), Albemarle Corporation (US), Clariant International Ltd. (Switzerland), Akzo Nobel N.V. (the Netherlands), and Solvay SA (Belgium). ▪ BASF has been mainly focusing on new product launches as a part of its strategic development activity. ▪ In March 2017, BASF announced the expansion of its new plastic additives plant in Shanghai, China to increase the production of antioxidants and associated blends. About Us • MarketsandMarkets™ provides quantified B2B research on 30,000 high growth emerging opportunities/threats which will impact 70% to 80% of worldwide companies' revenues. 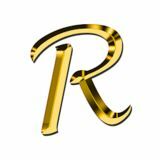 • Currently servicing 7500 customers worldwide including 80% of global Fortune 1000 companies as clients. Almost 75,000 top officers across eight industries worldwide approach Markets and Markets™ for their pain points around revenues decisions. • MarketsandMarkets’s flagship competitive intelligence and market research platform, "Knowledgestore" connects over 200,000 markets and entire value chains for deeper understanding of the unmet insights along with market sizing and forecasts of niche markets. How Markets & Markets is different? ➢ Most-detailed market segmentation in the industry ➢ In-depth analysis of patents and profiles of key market players providing a competitive landscape ➢ Market data for segments such as technologies, services & applications across geographies ➢ High level analysis of major market segments and identification of opportunities.